City driving is different from country driving. There’s a reason people go for Sunday afternoon drives down country lanes and not down Main Street. Whether you’re driving along Broadway in New York City or around Clinton Square in Syracuse, you need to quickly take in and process a great deal. The traffic in New York City, of course, has a special reputation, but all of the cities in New York State have busy streets. 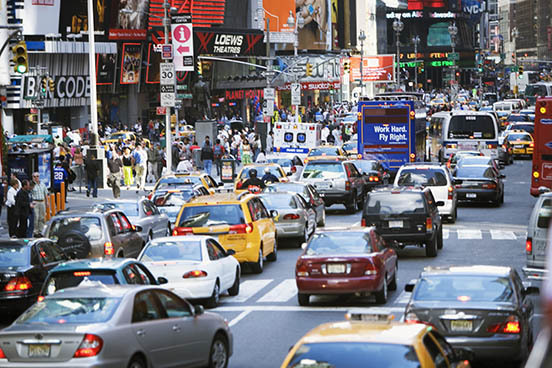 Here are five defensive driving tips to help you navigate the traffic in New York’s cities safely and without incident. Driving in a city is a lot easier if you know where you’re going. If you’re familiar with the city’s layout, you can focus solely on traffic signals and other cars because you don’t need to worry about whether to turn left or right at the next intersection. If you ever can’t decide which way to go, just go. Making a wrong turn is better than stopping in the midst of traffic. Once you can find a safe place to pull over, you can review your directions and get headed back in the correct direction. Never stop in a place where traffic will quickly come up on you, though, as that puts you in a dangerous position. If you’re stopping anywhere in a city and don’t want to pay for a parking garage, you’ll likely have to parallel park. Chances are, you won’t just have people watching you when you make the maneuver, but cars will also be whizzing by. Practice beforehand if it’s been a while since you pulled up to a curb, so you can get comfortable doing so in a controlled, not-chaotic environment. On the rural roads in Upstate New York, you need to constantly watch for deer. On the city streets in New York City, Albany, Syracuse, Rochester and Buffalo, you need to watch the crosswalks. Pedestrians often have the right of way if they’re in a crosswalk, and many will exercise their right. Constantly be checking any crosswalks you pass, which may be at intersections or in the middle of city blocks, for pedestrians who are either looking to cross or already crossing the street. If you aren’t confident about driving in one of New York’s cities, enroll in a NY defensive driving course. An instructor can review these and other driving tips with you, and help you get valuable experience driving on city streets that will give you more confidence. After just a few lessons, you’ll likely be comfortable going places on your own. Safely navigating the streets of New York’s cities requires skill and experience. Keep these defensive driving tips in mind, and they’ll help keep you and those in your car safe when you’re driving down even the busiest of New York’s streets.